Performance management software vendor eG Innovations has announced the general availability of their eG Enterprise 6.3 offering. The highlight is the availability of the first native performance monitoring capability for Citrix virtualized desktops and applications managed by a cloud service. It includes another enhancements as well, such as new support for Citrix Linux VDAs, and deeper visibility in monitoring for the NVIDIA vGPU. The eG Innovations global offices are in Singapore, with U.S. offices in New Jersey. They are quite global in scope, with about half of their revenues coming from North America, 30 per cent from Europe and 20 per cent from Asia-Pacific. Ramanathan said that while IT monitoring once focused on CPU memory and disks, it has shifted to be mainly around user experience today. Citrix monitoring is only one component of the company’s business, as they also do other types of application performance monitoring, enterprise application monitoring and unified monitoring. Citrix VDI monitoring is the most significant component however. Ramanathan said that it accounts for half of EG Innovations’ revenues. Ramanathan said that VDI performance management is even more challenging than monitoring web applications, because if there’s a glitch with the VDI, it wont work at all. In addition to Citrix, eG Innovations Enterprise also supports competing technologies like VMware Horizon and Microsoft RDS. However, it’s of most interest to Citrix resellers, he indicated. 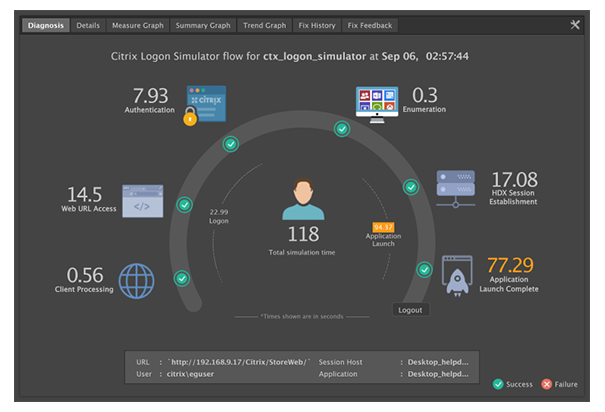 The ability to natively monitor performance of key elements of the Citrix Cloud control plane, the Cloud Connectors and the Citrix resource plane has only recently been made possible. eG Enterprise 6.3 now provides monitoring support for the latest [7.16] version of Citrix XenApp and XenDesktop. “We keep track of new enhancements in Citrix family,” Ramanathan said. “They recently introduced a new protocol for Citrix HDX adaptive transport, and we can track the progress of this latest enhancement. “We only supported Windows here in the past,” Ramanathan said. It also provides deeper visibility for NVIDIA vGPU. Beyond the additional Citrix support, Enterprise 6.3 also expands instrumentation to monitor AWS services and support for Microsoft Azure Resource Manager. “We are starting to see customers looking at other cloud options for virtual desktops, such as Virtual AWS Workspaces,” Ramanathan said. “We can now provide similar visibility for these environments, to help anyone deploying workspaces in the cloud. It lets admins manage the user experience and deliver the kind of reports they need. Full diagnostic support for Microsoft .NET packaged and custom applications has also been added. “Last year, we introduced the ability to go deep into the Java stack,” Ramanathan said. “With this release, also support this for .NET, to provide that same core level visibility. This version also provides out-of-the-box support for many new network devices and storage systems, including Pure Storage and Dell EMC XtremIO All-Flash Array Storage. eG Innovations sells through a hybrid model, but most of their business goes through channel partners.